The following list of updates were posted to MayoMedicalLaboratories.com during the month of June 2016. The following list of updates were posted to MayoMedicalLaboratories.com during the month of May 2016. The following list of updates were posted to MayoMedicalLaboratories.com during the month of April 2016. The following list of updates were posted to MayoMedicalLaboratories.com during the month of March 2016. The following list of updates were posted to MayoMedicalLaboratories.com during the month of February 2016. The following list of updates were posted to MayoMedicalLaboratories.com during the month of January 2016. Mayo Medical Laboratories has launched a new process for communicating CPT Code and LOINC Code Updates. The following list of updates were posted to MayoMedicalLaboratories.com during the month of December 2015. 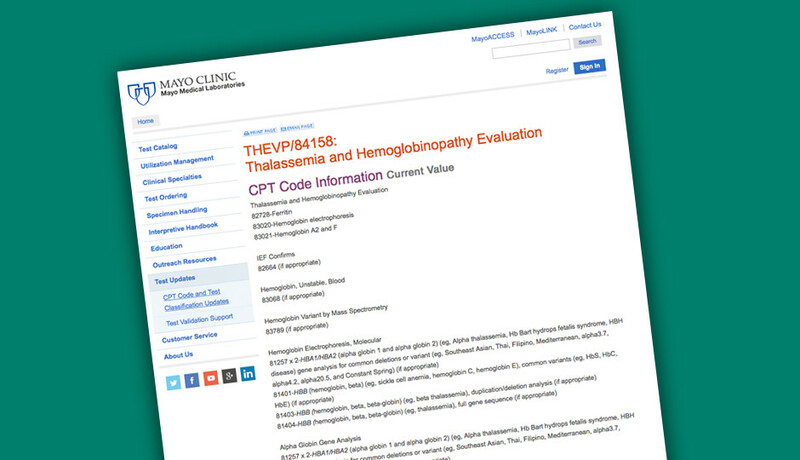 Mayo Medical Laboratories has launched a new process for communicating CPT Code and Test Classification Updates. View this post for a list of updates that were posted to MayoMedicalLaboratories.com during the month of October.